Are you looking for information about Blue Heeler puppies? Also referred to as Australian Cattle Dogs and Queensland Heelers, Blue Heelers are wonderful and versatile dogs. Whether you are looking for a loyal canine companion that is highly intelligent, a skilled hunting dog with excellent instincts or a working dog that can help keep a large herd of cattle in check, you can't go wrong with this breed. These dogs do, however, have strong personalities and herding instincts. Make sure that you are fully aware of what it's like to live with a herding dog before you decide to bring a Blue Heeler pup into your home. What Kind of Dog Is a Blue Heeler? Blue Heelers are true herding dogs. They were originally bred specifically for the purpose of providing assistance to Australian cattle ranchers who needed help keeping large herds together. Their signature herding technique is to nip at the heels of the cows in order to move them in the desired direction. This tendency to nip at the heels is where the "heeler" part of the name comes from. Blue Heelers are compact and strong. They typically stand between 17 and 20 inches tall and weigh between 30 and 45 pounds when fully grown. The "blue" part of the name comes from the fact that their coats feature the unique merle combination of black and white hairs that appears to be dark blue. While the name is partially derived from coat color, it is important to note that the coats of Blue Heelers are not uniform in appearance. While there is some blue merle present on each dog, their coats can also include brown and are often described as patchy or mottled. The Blue Heeler's coat is made to withstand weather extremes. The fur is short with a dense undercoat and other than a regular brushing a few times a month he doesn't require much grooming. Blue Heelers will blow their undercoat about once or twice a year rather than shedding consistently. These periods will last a few weeks and generally occur during the change of seasons. As with other herding breeds, Blue Heelers are extraordinarily loyal and intelligent canines. They are considered one of the smartest breeds of dogs. Skidboot, a YouTube favorite for his amazing display of tricks, is an example of a brilliant Australian Cattle Dog. Are Australian Cattle Dogs Aggressive? Blue Heelers are known to have issues with aggression to both other dogs and people. Because they were bred to protect herds and a farmer's property, they are naturally suspicious of strangers. 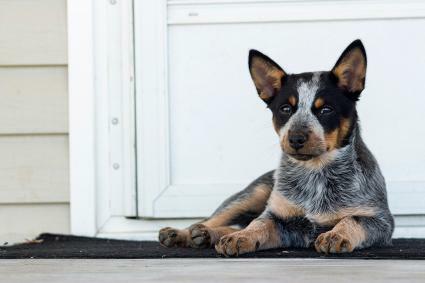 If a Blue Heeler puppy is not properly socialized, he can grow into an adult that will be distrustful of people outside of his family and bite if he feels they are being threatened. Lack of socialization can also result in aggressive behaviors toward other dogs. 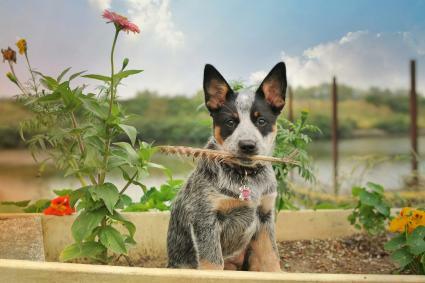 Blue Heelers can also display guarding behaviors toward food, chews, and locations, to name a few. This guarding behavior can occur toward other dogs or people, even its human family members. They are very alert and tend to have independent personalities. Additionally, while they are relatively compact, they are quite strong and have extraordinary stamina. They can be friendly and loving dogs to their owners and humans they are familiar with, but are generally wary around strangers. As puppies, they love to chew. For these reasons, it's important to begin obedience training and socialization with Blue Heeler puppies when they are very young whether they will be family pets or working dogs. One aspect of Blue Heelers that owners like is their quiet, intense nature. They don't tend to bark very much at all other than to alert their owners. It's important to remember that, while Blue Heelers can be trained fairly easily, you can't remove herding instincts from their nature. If you don't live on a farm where your dog has a herd of cattle to protect, your family and any other pets that you have will become the animal's herd by default. Your dog will watch over you with great loyalty and affection - but if you don't do what he wants - he just might nip at your heels. On the flip side, you can be confident that your Blue Heeler will be quite protective of your family and your household in all situations. Are Blue Heelers a Good Family Dog? Blue Heelers can be wonderful family dogs if raised with children who are taught to interact correctly with a dog. They are known for being loving and bonded to their human families. However, they may be a better choice for a home with older children. Their high energy level and tendency to be mouthy and nip at the heels of running children can be problematic around infants, toddlers and younger children. Blue Heelers puppies that have not been taught bite inhibition can become adults that "bite" because of their instinctual nipping behavior. While anyone who brings home a Blue Heeler should work on puppy mouthing behavior, it's especially important to do so if you have children in the home. Australian Cattle Dogs are a hardy breed, but like most purebred dogs, they some common genetic conditions. Progressive Retinal Atrophy is an eye condition that leads to blindness. Hip Dysplasia is a painful condition of the joints that can lead to lameness. Osteochondritis Dissecans (OCD) is a joint disease that can affect a dog's shoulders, elbows, hips or knees. Congenital Hereditary Sensorineural Deafness (CHSD) can be found in approximately 10% of the Blue Heeler population. Portosystemic Shunt is a structural problem involving the liver and vascular system requiring surgery. A popular crossbreed is the Texas Heeler, which is the breeding of a Blue Heeler to an Australian Shepherd. The mix is very popular in Texas, hence the name, and is used as a working dog on farms and ranches. They are also favored by dog sports enthusiasts for their stamina, intelligence and drive. The Australian Cattle Dog Club America (ACDA) is the American Kennel Club (AKC) Parent Club for this breed. 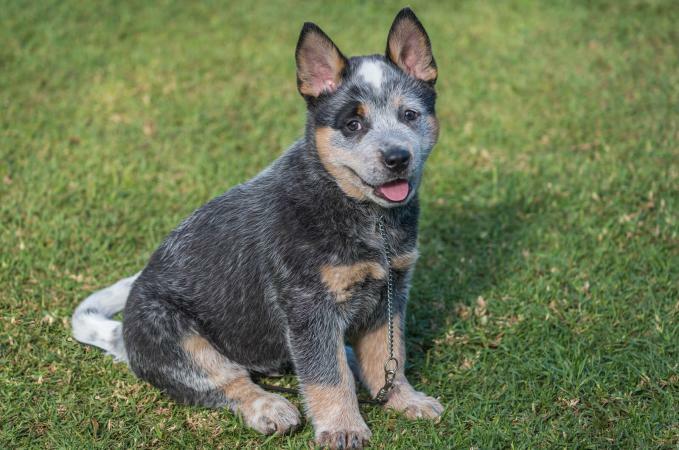 The organization provides a referral directory that is a good place to begin a search for reputable breeders that specialize in Blue Heeler puppies. The directory is organized by state, and this makes it easy for you to locate a breeder near your geographic area. Of course, many breeders will ship puppies to new homes, so you don't have to limit your search to your home state. How Much is a Blue Heeler Puppy? A pet quality Blue Heeler puppy from a reputable breeder will average about $500 to $525. Puppies bought for breeding or "show quality" can cost quite a bit more. These prices range from a low of $1,800 up to over $5,000. The listed breeders have all paid a fee to be included in the ACDA's directory and have signed the organization's code of ethics as a condition of being included. As with any attempt to purchase a purebred puppy, no matter how you find a kennel you should still conduct your own due diligence. Be certain that the breeder you are considering working with follows appropriate, ethical breeding practices and that the puppies and parent dogs have been properly cared for, in terms of both living conditions and veterinary care.